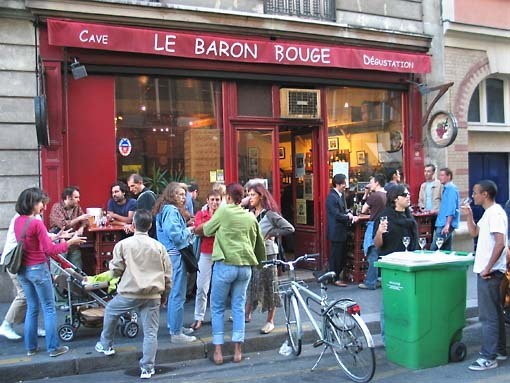 Some pictures and the wine prices were re-actualized in april 2007 Le Baron Rouge at rush hour This is an ordinary weekday at Le Baron Rouge, a wine bar located in the 12th arrondissement close to the famous street market "marche d'Aligre" . This was yesterday, thursday. We arrived at about 6.30 pm. There were just a few people when we walked into the bar. By the time we left, at maybe 7.45 pm, there was so many more people, inside and outside (That's when the picture was shot) First, how to get there : It is close to the Bastille. We came on motorcycle but subway is convenient, it is close to the Ledru-Rollin metro station on line N°8. When you reach the street level, watch for a park at short distance on Rue du Faubourg Saint Antoine. Go there and turn right, walk along the park and at the end of the park take left on rue Théophile Roussel, it will be few meters on the right. 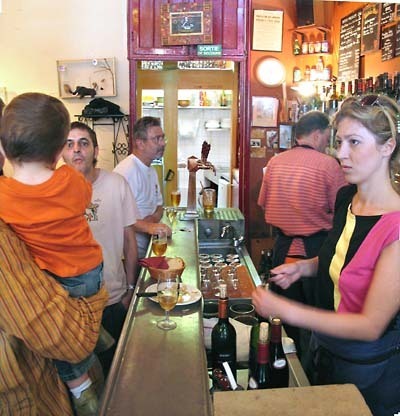 But it may be also interesting to drop there at the end of the day, from 6 pm when the "habitués" living or working in the area begin to flock to the bar for an "apero" to celebrate the end of the work-day . The area is a densely-populated, middle-class neighborhood and I envy these patrons that just walk a few seconds or minutes from work or home to have a drink and enjoy the good time here. The wines on the blackboards are "vins de Proprieté", family-estate wines from the french wine regions. About 25 reds and 15 whites are served by the glass (10 cl) with prices starting at 1,4 Euro. The prices seem quite reasonable, which is why the crowd too, I guess. What I also like about this place is that you can buy some wine in bulk. They have a few casks inside on the left and you can bring your, say, 10-liter container and take it home (or bring a 1-liter bottle and have it filled when you need it)They even lend empty bottles if you forgot to bring yours. On my last visit (april 2007), prices for bulk wine started at 2,8 Euro a liter. Some of the casks had "organic" written on their blackboard. While it's pretty common for individual customers to buy wine in bulk in the french wineries, it is now rare in Paris. 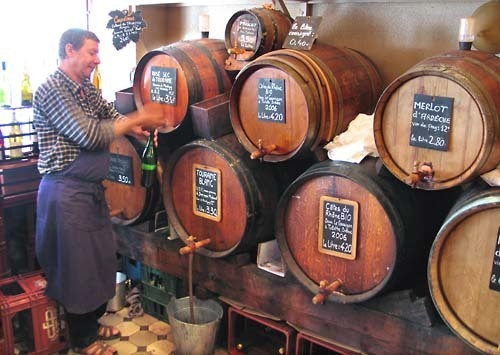 But long time ago (before WW2), that is how parisians would buy their wine : straight from a cask in a wine shop, as estate bottlings were a modern invention. If you want to eat with your wine, Le Baron Rouge has many different small dishes . Charcuterie , saucisson , etc...Simple plates are 5 Euro . A "Planchette" of saucisse seche from Cantal (region known for quality charcuterie) like the one on the picture costs 5 Euro . A corsical plate is 7,5 Euro . 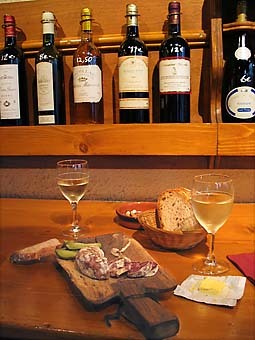 A large composed plate has 3 different charcuteries for 9,5 Euro . Looking at the wines on the list , I notice a Touraine by Jacky Preys , a Valencay wine producer in Meusnes . I'll try this one next time . Sunday morning is also a good time to visit (wine bars open on sunday are not so common) because the Marché d'Aligre reaches peak activity then . We just got back from Paris - a man at a wine shop near the Pompidou recommended this place and it was the HIGHLIGHT of our trip. A real local Parisian experience. A gem of a spot. Great wine, delicious cheese plate, reasonable prices, friendly proprietors, great crowd ... I could go on and on. We bought two bottles/litres to go and they were both delicious. A Merlot at 2.80 and Rhone at 4.40. The one thing is that non-smokers are going to have to tough it out with a TON of cigarette smoke. It was a bit rough in the end but well worth it for the overall experience. I was there in October of 1997. Great neighborhood bar. I still have a bottle that I bought there. (empty now!) Most locals bring their own bottles to be filled I found out. Great atmosphere. Meet a Parisian diplomat from Africa. Very nice fellow who live in the area. Just a great experience. I discovered this lovely Cave a Vin (Wine cellar) in 1986 when I lived in the neighborhood. I followed my mentor chef Phillip to Paris from Tel-Aviv Israel where he used to reside and he is the one I owe many thanks for introducing me to Le Baron Rouge. During the course of the next few years (while attending cooking school) I visited Le baron many, many times. Since leaving Paris I always return to visit Le baron every time I am in Paris. I send many of my friends to visit the place and I must say that places like this are very rare find in Paris. It is authentic and genuine and offers a great experience for those who wish to know the true Paris. My girlfriend and I went to this place last August and it was easily the best place we visited during our time in Paris. The two chaps behind the bar were friendly, generous and knowledgable. we stayed longer than we intended, bought a bottle to take away from their selection of barrels by the door. I gave them the change from a 10 euro note, which they would not take but i insisted. So then when we went to leave, we said goodbye and he insisted that we stay for one more drink as we had not had a drink with him. He knew which wines we had tried (an amazing feat because we had sampled a fair few!!) and suggested two others for us to have. We did, we enjoyed them greatly and went on our very merry way. Another point is that it was empty when we arrived as soon as it opened in the afternoon and was packed by the time we left. A really good place and we will be going again this weekend! My wife and I went to this wonderful place in February for our anniversary. Being in the off season, it was not very crowded at all. The gentleman behind the counter recommended a variety of cheeses to go with the wine we were drinking. Before heading back to our hotel with our bottle of wine, we stopped by the open air market and picked up some bellota ham which went great with the wine we purchased. This is one destination we will be going to again! I am an old friend of Gene. This is Anslem Yazzie. What's up? 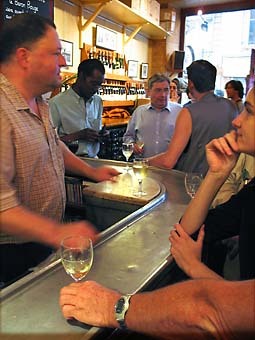 Thank you very much for your blogging on the Paris Wine Bars! I am meeting some friends there this Saturday who are visiting from the US. Your reviews helped me so much in making a choice! Your detail and descriptions make me feel as if I were right there with you! My first experience in Paris...amazing . I was just for two days, and I was lucky to met a wonderful person Giancarlo who shows me Le Baron Rouge. We passed amazing evening there, drinking Typical Red Wine and eating fresh oyster...Very nice particular, typical place with nice people, warm atmosphere...it will stay in my mind. I will turn back in Le Baron Rouge for sure, when I visit again Paris.